Farmers market season is in full swing, and the next two days mark the return of two markets right in the heart of downtown DC. First up, the FreshFarm Market by the White House opens today at 810 Vermont Ave. from 3 to 7 p.m. José Andrés and the team from Jaleo will be cooking a massive paella starting around 4:30 p.m.
And this Friday, one of the area's newest markets kicks off its season. 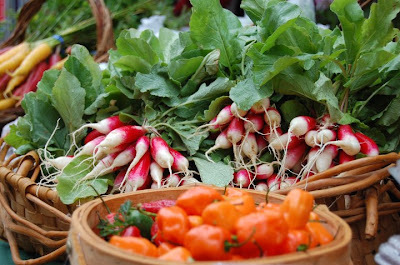 The Capital Harvest on the Plaza Farmers Market, located at 1300 Pennsylvania Ave. NW at the Ronald Reagan Building on Woodrow Wilson Plaza, starts May 7 with live music and chef cooking demonstrations. Vendors will include MeatCrafters, Santa Lucia Estate Coffee, Hawks Hill Creamery, Lois' Produce, Gun Powder Bison and lots more. The market will be open Fridays from noon to 5 p.m.
To find a farmers market near you, check the Washington Post's farmers market map.